Every so often I have to pinch myself to check that my job in wine is actually real. Am I really standing here swirling this glass of Grand Cru Burgundy and calling it work, or is it actually me that’s whirling in a giant vinous vortex of virtual reality, soon to be confronted with life’s cruel reality? It was just one of those moments when our events team unexpectedly asked if I was interested in co-hosting a chocolate and whisky tasting in our cellars. It must have taken me a whole nanosecond to blurt out a breathless “Yes, please”, then several more full seconds to compose myself. Beyond wine and spirits, craft chocolate is a real passion of mine. There are so many similarities with fine wine, yet it is only in the last 20 years that artisan chocolate has become truly popular. I instantly started thinking about which matches might work best. It only took a little delving to realise that this would need some hands-on practical research. Berry Bros. & Rudd’s newest Master of Wine, Barbara Drew and I have since had the arduous task of trialling several chocolate and whisky combinations: white, milk and dark from all corners of the globe, flavoured and plain, truffles, caramels and bars. Having to pair these chocolate treats alongside New and Old World whiskies, both delicate and rich, smoky and sweet, has been – ahem – bittersweet. Chocolate is regarded as an ideal partner for whisky, its high alcohol, expressive personality and compatible flavour notes helping to balance the palate-coating properties of chocolate. Many Scottish distilleries actually hold tastings to find that perfect pairing for their popular releases and I have no doubt the same is true of other whisky-producing nations. Chocolate makers and chocolatiers (the two are different) have also looked to make the most of whisky’s affinity with the cocoa bean, ageing chocolate in Bourbon barrels is a particularly recent trend of note. 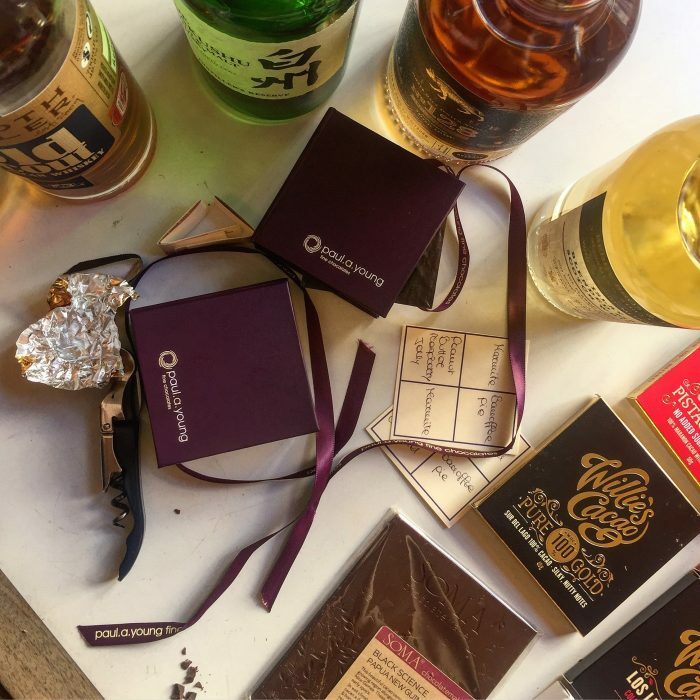 There are a myriad possibilities when it comes to matching chocolate and whisky. Chocolate varies in style due to terroir, just as wine does, and when you consider the varying styles of whisky from around the world researching them can become quite… well, intoxicating. We have a little more research to carry out before the line-up for November is complete, but with a touch more “hard graft” I think we’ll crack it, and while my head is spinning from all the combinations, I have pinched myself several times with chocolate-stained fingers and can confirm this is actually happening. Peter Newton and Barbara Drew MW are holding a Whisky and Chocolate Tasting on Friday 9th November; book tickets here.